Shen Xin’s films are steeped in the cool sensitivity of an artist all too aware of the tentative relations of power, framing and gesture inherent to lens-mediated space. Throughout Strongholds (2016), as her camera skates over scenes of would-be pastoral intimacy, the rotor of the camera drone grinds like an electric carving knife to the ears. 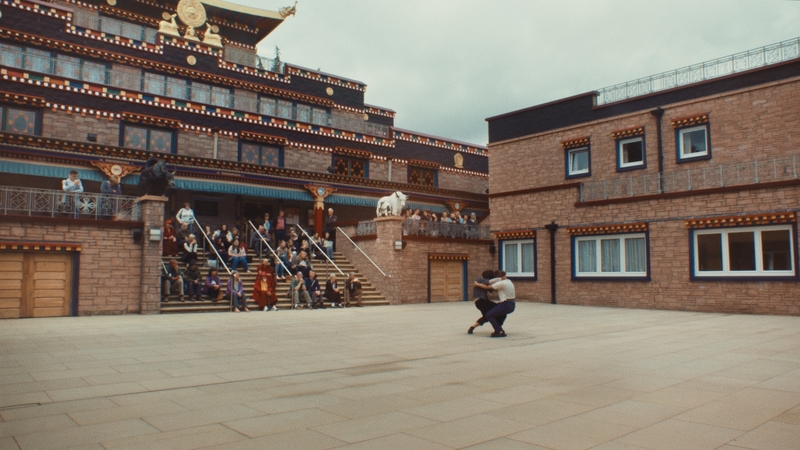 A young Dutch couple has travelled to rural Scotland to hold a dance performance in the courtyard of the largest Tibetan Buddhist temple in Europe. They bathe, they ramble and they talk. Throughout, Shen’s camera patiently observes — and is observed by — a soulful relationship that plays out through the knots and quivers of spiritual and interpersonal meditations. In many ways, the title of the exhibition’s eponymous work is instructive: a stronghold alludes at once to the shelter of fortification and the actively strenuous force of holding on. Like the Red Queen, we run as hard as we can just to remain on the same spot. The exhausting yet intangible circuits of emotional labour — as the similarly sensitive writing of Shen’s one-time collaborator, the late Mark Fisher, made clear — are jacked into the very same networks of capitalist accumulation that establish the parameters of our individual, social, and temporal imagination. It’s not only that “the personal is political”; it’s something more insidious, yet perhaps also more politically constructive. That the proprietary self-consciousness, prejudice and solipsism commonly attributed to the fallible instincts of “human” interiority are quite commensurable with our networks of value exchange seems politically potent and perfectly depressing. Individual and collective suffering commingle and commodify; data conspires with desire to get rich, fast. Provocation of the Nightingale #1 (2017), which forms the other half of the exhibition, presents a Socratic dialogue between unlikely interlocutors. Two women, a Buddhist teacher of meditation classes and one of her pupils, a manager for a commercial DNA testing service, are caught in a tentative romance. The lingering critiques that characterise their doleful discussion of one another’s attitudes and living practices rub up against their intense mutual attraction, itself ethically compromised by the power structure of their student-teacher relationship and the vulnerabilities of past trauma.Ostensibly a meditation on the biopolitics of scientific speculation and quantified selves (the true Nightingale revives the king who has become obsessed with the song of the mechanical bird), the protagonists find themselves caught within feedback loops between the biological and the spiritual, the affective and the geographic, critical knowledge and lived experience. Shen’s dialogue invokes a complex of interwoven ideologies, through which emotional vectors tauten and crumple the warp and weft of the tapestry itself. That other recent bereavement to social theory, Zygmunt Bauman, once suggested that the porosity of globalisation has entirely deprived sovereignty of its power to economically, legally and culturally define the world. Instead, flows of dynamically distributed power multiply through webs of information, finance, and affect. While Shen Xin’s works take interpersonal complexities as their narrative focus, a geopolitical resistance forms, perhaps inescapably, the ground of understanding, cutting through the network at diagonals. Islands of vulnerability are revealed within hardbitten belief systems, while new fronts of resistance coalesce. Therein, perhaps, are the strongholds.